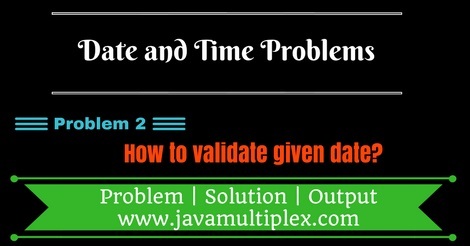 Home Date Interview Questions Medium Date Questions How to check whether given date is valid or not in Java? Write a program in Java that checks whether given date is valid or not. A date is valid if it satisfies following constraints. It should be in correct format. For example - dd/MM/yyyy. It exist in reality. For example - 30/02/2015 is not exist so it is invalid. For validating first constraint we are using Regular expressions and for second constraint setLenient() method of DateFormat class. Few points to note down about setLenient() method. By default setLenient() is true. Means, it won't check whether date exist in reality or not. To make it eligible for validating real dates we have to turn it off. * @problem Check whether date is valid or not? * date in reality, So invalid. Tags : Date and Time Problems, Date validation in Java, SimpleDateFormat, Regular expressions, if else statement, String, DateFormat.